This Thanksgiving, let us do the cooking so you can sit back and relax with your family and friends.Wouldn’t it be nice if you didn’t have to do any of the cooking and cleanup? Thanksgiving should be time spent around the table as a family, sharing stories and laughs. That’s why we would love the opportunity to cook for your family. We understand how special eating a hand prepared thanksgiving feast is, that’s why we’re only using the finest ingredients to deliver a meal your mother would be proud of. This year, make Thanksgiving Dinner reservations at Oscar’s Steakhouse. Bring your family and enjoy a special four course dinner prepared by our Chef Jeffrey Martell C.E.C., where he prepares some of Oscar Goodman’s favorite recipes and the best steaks in Downtown Las Vegas. Our special four course Thanksgiving Dinner includes light festive salads, creamy rich desserts, and roasted turkey. It starts with a Roasted Beet and Carrot Salad topped with walnuts, red onion, gorgonzola blue cheese, arugula, and balsamic dressing. The second course will consist of a Butternut Squash soup, incorporating one of fall’s most beloved flavors. 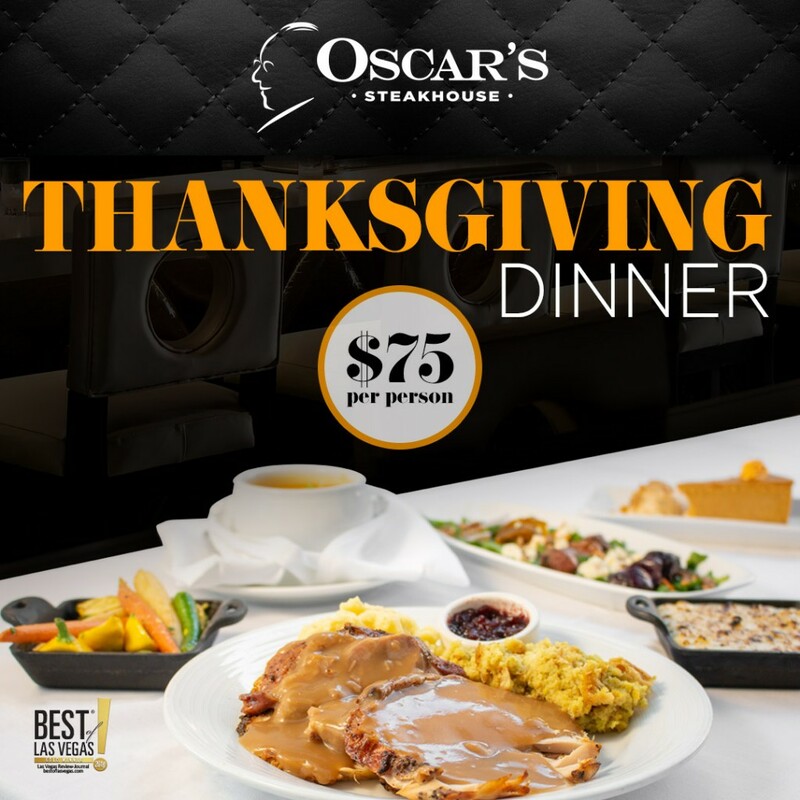 For the main course, Oscar’s will be serving up a perfectly roasted turkey with dressing, baby vegetables, corn brûlée mashed potatoes, cranberry sauce, and giblet gravy. This unique combination of flavors will make this Thanksgiving a feast you’ll never forget.For dessert, Pumpkin White Chocolate Cheesecake with Pumpkin Spice Latte Ice Cream. That was a mouthful…of delicious pumpkin inspired treats. After you’re meal, we’ll get the dishes, so your family can head straight into Black Friday and score some great deals on gifts. Make it a game and try and keep each other guessing. Thanksgiving is more than a meal, it’s time shared shopping, watching, playing, listening, or doing anything you enjoy doing as a family. Oscar’s and the Plaza Hotel & Casino are steps away from the Fremont Street Experience and minutes from Downtown Las Vegas attractions (check out our blog 20 awesome things to do in Downtown Las Vegas). 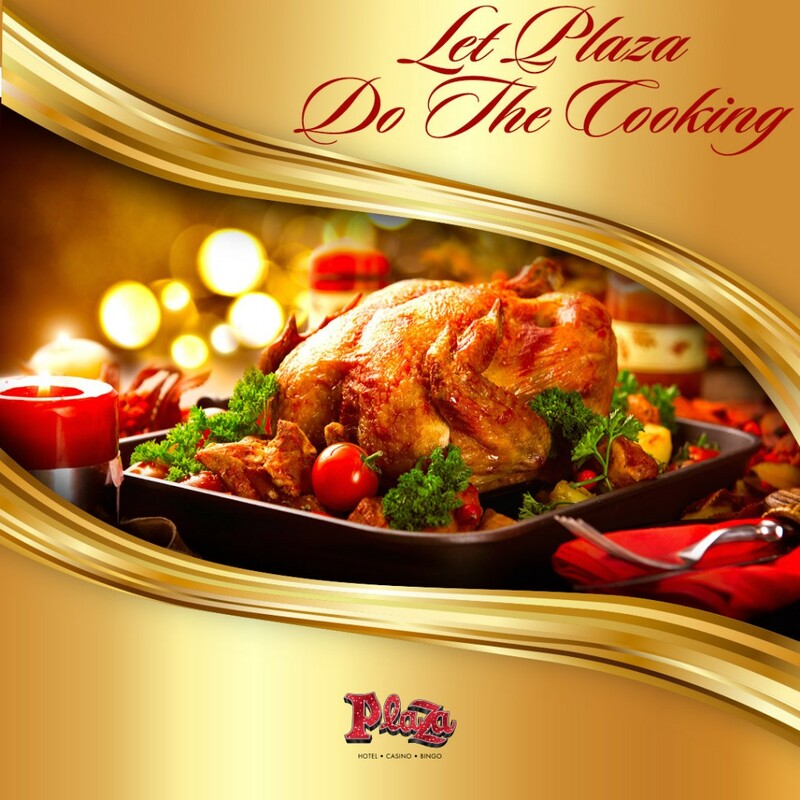 To make a reservation, call us now.